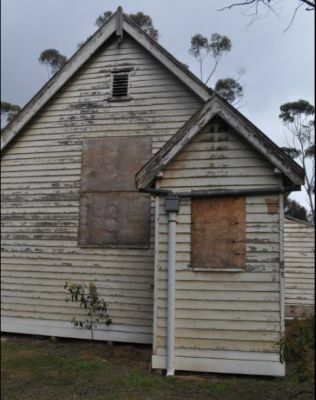 The Back to Steiglitz Association has been trying to save part of Australia’s heritage - an irreplaceable school building. Steiglitz is described in a 2013 Heritage Report as ‘one of the most important early gold rush towns in Victoria. Amongst the best ghost towns in the country, it’s also the last town in Victoria without electricity. Over 60,000 tourists enjoy its serene bush setting annually. Steiglitz boasts a handful of historic buildings, one designed by renowned architect Henry Bastow. However it's school is missing and could be relocated back into the Steiglitz community. Once beautiful and larger than a normal school for that time - to cater for a bustling gold rush town, this schoolhouse as seen above in around 1890s has been neglected so long it’s now derelict. ............ and time is running out for this building. This school is part of their community. Historical authorities agree with BtS - this building is special. Their detailed management plans, academic papers, and reports confirm the importance of this town. Filled with facts, figures and citations, their expert opinions add weight to the worth of every building in Steiglitz - especially its school. Presently in an isolated location where it was moved to in 1980, it is continuously vandalized. BtS believe the school won’t survive where it is. It is on land owned by the Department of Environment, Land, Water & Planning - and the school building was gifted to BtS a few years ago on one proviso; it be moved. BtS began searching for a new site. Everyone jumped on board – Shire, Engineering Consultants, local land owners, a renowned Doctor of Architecture, even politicians. Dr. Fiona Gray, Deakin University’s Faculty of Science Engineering and Built Environment, in her July 2016 paper focuses on this very school and discusses the difficulties faced when protecting historic buildings. How complications, such as cost and planning, can make custodial inertia an easier option then conservation. Dr. Gray asks whether this plays a role in the severe state of disrepair seen in many historic sites today. Posing an interesting question: should such custodial neglect be viewed as a form of demolition?